Marybeth Wehrung did the calendar art, and Simon Thrasher inked in the dates. 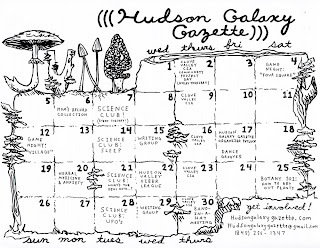 The back of the physical calendar (which can be found all over the HV and mailed/delivered by request, of course) was designed by Giulia Fleishman, and has descriptions, locations, and times for all events. The print is rather small to get it all crammed in, so the scanned product just ain't fit for posting. But, grab yourself an actual copy, or go to the website's calendar to access all that info! Look at the cool stuff you could be doing this month! We're just gettin' going with herbal medicine talks, fiber clubs, dance lessons, writing groups, UFO discussion nights, science nights, plant walks, band-in-a-hat tomfoolery, game nights, etc. Soon the website will have a proposal form on it, where you will be able to propose events/workshops/ideas to us for the next month's calendar! We want a ton of diverse stuff, and want the calendar to be bursting at the seams next time around, so please get brainstorming! Matt Ross designed the website, he's a mega genius. A really neat zine shop in Melbourne, Australia has requested to sell my zines. And, why not? Australia's all far away and stuff. They might as well know all my personal junk! They're called the Sticky Institute, check them out here. I'm mailing them out soon. My pal Lisa Perrin started a portrait exchange project, in which friends pair up and create portraits of one another! Simon Thrasher and I teamed up, and here are our results. I decided to sew him. To his left is a flowering osha plant, and to his right is an echinacea flower. Both are natural remedies used in lyme disease treatment. I made his shirt out of a galaxy. He drew his portrait of me on an old library book check-out card from a book about witchcraft! A very appropriate ode to my arm-wrestling alter-ego, my occupation as a bookseller, my mother's lifelong career as a librarian, and my general interest in magicks. Well done, I say. I have received word that I will be teaching girls how to play rock music this summer in Brooklyn at the Willie Mae Rock Camp for Girls! Holy heck, I'm so excited. I'll be teaching guitar lessons daily, as well as operating as a week-long band coach for what I'm sure will be the coolest band ever. It's a week-long stint, and at the end there's a big show that all the bands play at. I can't wait to do all this/I hope I get assigned to teach guitar to a musical kid prodigy who will end up turning the tables and teaching ME a billion things. No matter what happens, it's going to be pretty great. Starting in July, I have work up at the Woman Made Gallery in Chicago, IL in the "Underground" exhibition. I won't be making it over there for the opening on July 8, but if you're nearby, you should! I'm sure it'll be jam-packed with cool stuff to look at. And what could be better?